There are few things worse than looking outside in the morning and seeing a heavy snowfall that you know you have to deal with. It may look pretty, but it’s very cold out there, and if you don’t get the shovel out and clear it away, you won’t get the car out of the drive. The simple fact is, you can make life a lot easier on winter mornings by reading our snow blower reviews and making an informed choice. 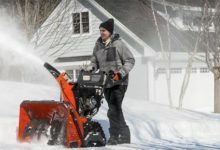 These electric machines simply scoop up snow and throw it out of the way, clearing your drive and path much, much more quickly than if you do it manually, and they are surprisingly affordable. 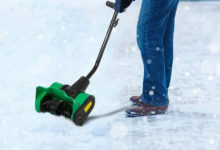 Now, if you’ve looked you will have seen that there are many different models of snow blowers to choose from, and the differences in the specification can be somewhat bewildering. So, here’s one for you to look at: it’s the Snow Joe SJ623E Snow Blower, and it is an impressive machine with excellent capability for moving snow, quickly and easily! To cut a long story short, a snow blower works like this: an auger fitted with blades is turned by a motor and picks up the snow, which is fed into a chute. From the chute, the snow is blown out to a distance, away from the path you need to clear. They come in many different shapes and sizes, and power levels, and this one is a very powerful, heavy-duty model. 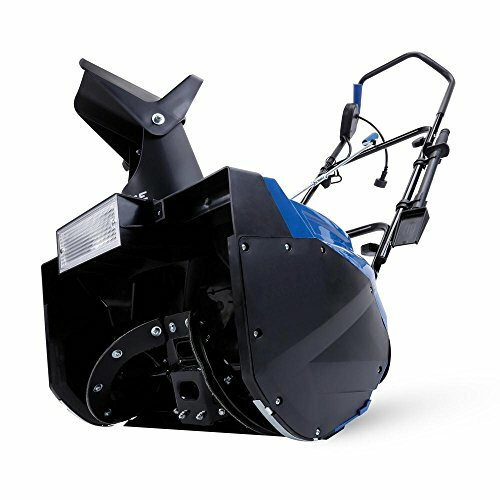 It’s worth knowing that you are dealing with a market-leading brand here, as Snow Joe has been in the business of manufacturing snow blowers of this type for many years. 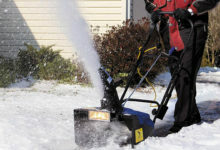 This model is a mains-powered version (if you’re looking for a battery powered snow blower, check out it’s brother the Snow Joe iON18SB Cordless) – hence you should know it has a permanent power cable that will need to plug into an outlet – and there are others that are cordless and rechargeable snow blowers. In brief, if you have regular heavy snowfalls, this is a model you should consider. 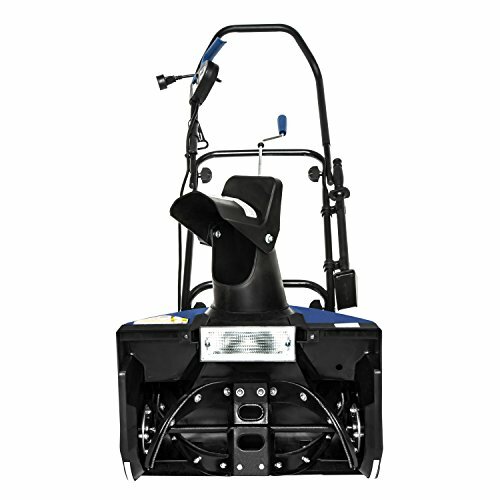 The Snow Joe SJ623E Snow Blower can remove snow up to 18inches in width and 10 inches deep in one go, and these are very impressive figures for a machine of this type. Let’s have a look at the features in a little more detail for you. 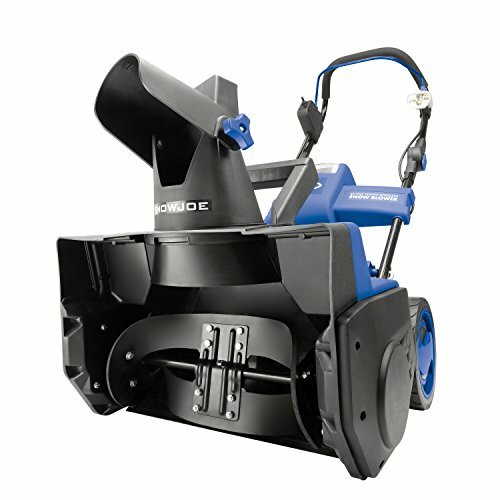 The Snow Joe SJ623E Snow Blower is, as mentioned, one you need to plug into the mains. This is a factor that some people will find off-putting, especially if they have larger areas to cover. However, it can be used with an extension cord, and this configuration of power also gives it added capability, which we will talk about later. A button-push start means that once plugged in you simply press the button and the snow blower is ready for use. It is also surprisingly light at 34lbs – not the lightest we’ve seen but not overweight – and has a 15-amp motor that is more than capable of delivering the goods. The chute on this model is able to be angled through 180-degrees by simple controls on the handle, the latter being nicely designed for ergonomics and comfort and adjustable for height. 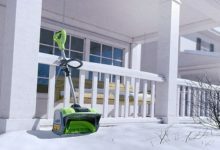 The four metal blades and strong, durable auger guarantee long life and powerful delivery, and easy glide wheels designed for snow use make it simple to move through the snow. This is not a particularly big machine, it measures 45 x 19 x 38 inches, and will stand away in a corner of the garage when not in use. A 20 watt halogen headlight is a major bonus for dark, cold, wet winter mornings when you simply want to get the job done and get back in the warmth! We can’t mention features without saying that this snow blower can move as much as 720lbs of snow per minute. Believe us when we say that is a simply amazing amount. If you have a large area to cover, we recommend you look at this machine, and if only an average sized space to clear then the sheer ability will cut the time you need to spend outdoors considerably. That’s an impressive list we’re sure you’ll agree, so let’s talk about it’s capability further, and whether it’s good for you. 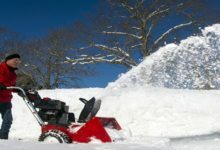 Capability – Is this the Snow Blower for You? If you’ve read this far, then the chances are you are hooked on the idea of getting a snow blower. 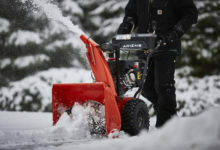 It really is a good idea as it will make life a great deal easier on cold and wet winter mornings, but is the Snow Joe SJ623E Snow Blower the model that does it for you? 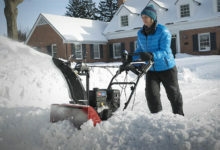 The Snow Joe SJ623E Snow Blower is clearly one that is intended for heavy-duty use: the metal auger, powerful motor, mains connection and capability are a testament to this. As is the fact it can clear a path 18 inches wide in 10 inches of snow in one pass, with ease. Remember that figure of snow cleared per minute – 720lbs – as it is important, and very impressive when compared with other snow blowers. Also, consider that the chute can be angled through 180 degrees and can throw the snow up to 25 feet, which gives you great scope for clearing very large areas. If you expect heavy snow, you want to put this model on your shortlist. 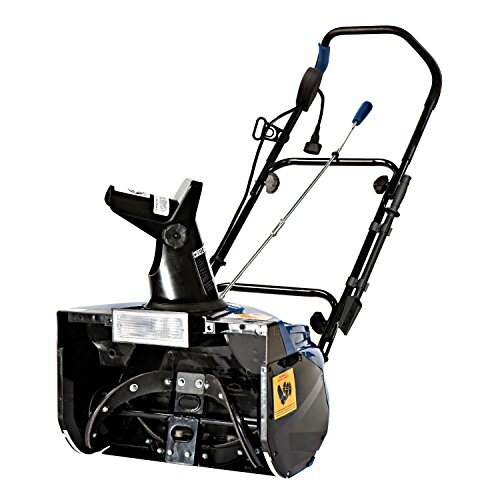 If there is one aspect of the Snow Joe SJ623E Snow thrower that will put a lot of people off, it is the fact it needs to be plugged into the mains when in use. If you have a very large distance from a power point to where you need to clear snow, this may be a problem. On the other hand, the mains power feature allows the Snow Joe SJ623E to be extremely capable and powerful, and there are few snow blowers on the market with this capability and performance, we doubt any of the cordless models come close to being able to clear this amount of now so easily. 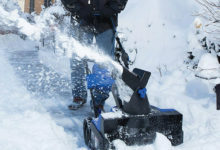 If the restricted distance of the cord can be overcome, and you need a snow blower that can clear large areas quickly, it could be that the Snow Joe Ultra Snow Blower is the one for you, and you may also be surprised how little it costs to buy.